Parents can enforce proper use of 9-1-1 at home to children pre-school age and up. Act out scenarios where mommy or daddy cannot come to the telephone but need help; have one parent act as the 9-1-1 operator. 9-1-1, what is your emergency? Remind them that 9-1-1 is to be used only in an emergency. It is not a toy. 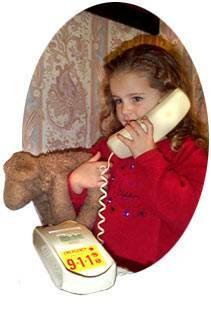 Remind the child not to hang up the telephone until told to do so by the operator. Unplug a telephone from the wall jack and have the child practice dialing the number 9-1-1. Emergency Communications is the 911 Center for the entire county, answering calls for police, fire, rescue and EMS. The 9-1-1 center offers a public education awareness program that can be taught to any age child. Trained dispatchers come out to your school, day care or place of choice and educate children on the uses of 9-1-1. Handouts are given to the children to help them better understand 9-1-1 and handouts are provided for the parents / guardians to help them teach their children when to call 9-1-1. The program helps children learn the proper use of 9-1-1. To request a visit, contact the office during normal business hours at 410-535-1600 or 301-855-1243 ext. 2230, or by email.